All Dan wanted was to be a good husband and father, to provide for his wife and daughter, to keep them fed, warm, and safe. But then the malevolent godlike beings called the Masters arrived, and their darkness spread across the world, reshaping it into a twisted realm of savagery and madness. In exchange for his family's protection, Dan now serves one of these alien gods, obtaining human sacrifices to feed his Master's eternal hunger. Like so many people since the world changed, Alice has had to do unspeakable things to survive. Unfortunately for her, she's Dan's choice for his next sacrifice. 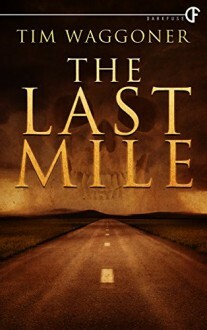 Now Dan drives along the shattered remnants of an old-world highway, headed for his Master's lair, Alice bound hand and foot in the backseat of his car. Dan may not like what he's become, but he'll do whatever it takes to protect his loved ones. Alice doesn't intend to relinquish her life so easily, though, and she plans to escape, no matter the cost. But in the World After, everything—animals, plants, even the land itself—has become a predator, and the journey to the Master's lair is an almost guaranteed suicide run. But Dan won't give up, and he won't stop fighting. Not until he makes it through the Last Mile.